His kidneys gave him away when he was 73 years young. Perhaps we needed a couple of decades more of his conscious life; another side, equally loving but a tad more compassionate, thinks perhaps he would have been better off leaving us 40 years ago thus avoiding all the tortures, solitary confinements, indignities, suicide of his beloved spouse who had heard from some sources that he had succumbed to torture by a praetorian guard of an unnatural country. Jam Saqi, who left us Monday the 5th of March 2018, may well be considered as a man who truly experienced the “real Pakistan”. A country, many have opined thus far, similar to its “twin” Israel, containing in its very genes the seeds of a flourishing garden of evil. Jam was barely three years old when this unfortunate country was created. By the time he was ten years old, the military-bureaucratic alliance with junior partners, feudal and comprador capitalists, had muzzled the Communists, socialists, even garden-variety democrats were in its crosshairs, hundreds were murdered in East Bengal for demanding language rights, a religious minority of Ahmadiya Muslims were massacred, civil liberties were systematically eviscerated. The hoax of a “Constituent Assembly” was finally tossed in the trash heap. Three minority provinces, Pakistan, Balochistan and then Northwest Frontier Province were amalgamated within the majority province of Punjab under an administrative set-up of One Unit; any conversation regarding the economic rights or other human rights such aboriginal languages of these minority provinces or their culture or their philosophic or spiritual creed was deemed seditious and blasphemous. Pakistani leaders had found a comfortable perch on the attractive lap of the US-led military bloc. Of course, the new country that had yet to establish a proper infrastructure for health care and education for its citizens, sent a large contingent of nurses and health care workers to serve in the US war in Korea. It also became a South-Asian “bulwark” against national liberation movements in Asia and beyond. Were it not for the US-CIA-led coup in Iran that saw an elected government squashed and replaced by a nightmare of Pehlavi Dynasty, Pakistan was getting ready to assume the role of a Central Asian gendarme of the West. It harboured bloated animus against the Bandung Conference and the concomitant Non-aligned Movement. 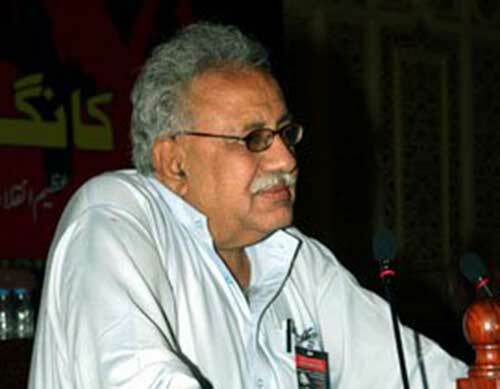 By the time he was twenty three years old, Jam Saqi, a much adored activist for the rights of the ones with the least in Pakistan, was one of the leaders of what came to be known as the “4th of March Movement”, organized by a coalition of students. On that day 1967, a march attended by tens of thousands of students, peasants, workers, intellectuals demanded repeal of all draconian laws, resignation of then dictator Field Marshal Ayub Khan and repeal of the One Unit Ordinance. In 1968, with its dependency on the West fully entrenched, Pakistan began a year-long celebration of what could well be construed as “Sam Huntington, Gustav Papanek, World Bank, and IMF engineered economic “decade of success”. The so-called “success” was achieved under a brutally repressive military dictatorship that saw mere 22 families owning over 80 percent of the Pakistani economy. During that time of commotion and of fanfare, Jam organized the Sindh National Students Federation, a Marxist student’s front with solid linkages with the Sindh Hari Committee, a peasant organization, and a variety of labour unions. The civil society struggle against Ayub Khan’s dictatorship became so strong that he stepped down “handing” over the reins of the government to General Yahya Khan. As is now almost customary, praetorian guards take over governments barking slogans of change. Yahya Khan was no exception. He promised repeal of One Unit Ordinance and to hold elections on the basis of adult franchise instead of following a wholly corruptible model of “limited franchise”, introduced by Ayub Khan in 1962. To everyone’s surprise, the General delivered. One Unit was indeed repealed by July 1970, free and fair elections were held for one national and five provincial assemblies. Jam was a tireless campaigner during these elections. He ran for a seat in the provincial legislature from Thar area of Sindh nearly winning from the largest feudal of the area. The December 1970, elections saw Awami League, led by the late great Sheikh MujiburRahman, win substantial majority in the national parliament. Mr. Zulfikar Ali Bhutto’s Pakistan People’s Party (PPP), won majority seats in national parliament as well as provincial legislatures in Punjab and Sindh. National Awami Party (NAP) won majority of parliamentary seats from Balochistan and Pukhtoonkhwa, also won majority in Balochistan Assembly. So far so good. For the first time, Pakistani people had freely cast their ballot. Another first, the constituent parts of Pakistan were ready to engage in a federation and the national assembly was about to begin its work of drafting a constitution. Paraphrasing a great song by Joni Mitchel, the people of Pakistan had by now seen “both sides of a false freedom” it had gained from the British. Of course, clouds did get in the way. Instead of transferring power to the freshly elected legislatures, a freshly minted alliance between Mr. Bhutto’s PPP and Pakistani military engineered a “silent coup” against Yahya Khan after having him declare war on the people of East Bengal. Pakistani military leadership solemnly announced to protect “Pakistani territory” in East Bengal even “if we have to kill every Bengali”. When the intellectuals were massacred on the Dacca University campus on the night of 25th of March 1971, Sheikh Mujib was arrested and over a hundred thousand Pakistani troops began the “cleansing” campaign inside the villages and town of East Bengal, the Awami Leage reluctantly announced establishment of the state of Bangladesh. Mr. Bhutto smugly announced, “thanks god, Pakistan is saved”. After all, his Faustian bargain with the devils of military had bloomed. As a keen student of history, Bhutto was cognizant of an inevitability of Bangladesh thus leaving the ground safe for him to rule over whatever was left of Pakistan. In west Pakistan, whatever shape civil liberties had hitherto existed were simply abrogated. Many activists, including this scribe, were imprisoned. Jam went “underground”. Of course, by this time he had become a much respected and adored leader of Pakistani left and was a part of the proscribed Communist Party of Pakistan. Indeed, on 16th of December 1971, just short of nine months, after murdering nearly three million Bengalis, 93,000 Pakistani soldiers threw their arms surrendering to the people of Bangladesh and the military of India. General Yahya was later deposed and held in custody. Mr. Bhutto became the first ever civilian, “Chief Martial Law Administrator”. The war came to an end. Bangladesh was a reality. Mr. Bhutto assumed the power without worrying about that pesky little thing called “majority” as the minority Pakistanis had effectively thrown out the majority after attempting to murder their millions to ensure West Pakistan would always enjoy a majority in a parliament. Jam remained underground during much of Mr. Bhutto’s rule during which progressive politics, periodicals, and pundits were largely proscribed. The elected governments in Balochistan and Pukhtoonkhwa were “dismissed”, as if it was up to the federal government to arbitrarily deny majority. Wali Khan and the bulk of NAP leadership was thrown behind bars, NAP was declared an “anti-national entity”. Jam and many others were charged with treason. I was held in Hyderabad and sometimes in Karachi prison facing a sedition charge. In 1977, in the aftermath of the elections a multi-party alliance of right-wing religious parties was formed, which began its civil disobedience movement. Jam and other progressives stayed out of that alliance. They knew full well that discrediting a civilian government, even one as corrupt and spineless as Mr. Bhutto’s would lead to military rule. After all, Mr. Bhutto had seen to it that the wholly tarnished image of Pakistani military after 93,000 of its best had surrendered to the volunteers of a rag-tag Bangladeshi freedom-fighting militia Mukti Bahini and the Indian army, was fully rehabilitated. That the military budgets had been exceptionally high during his tenure; that the military was commissioned by him to destabilize and oust civilian government in Balochistan while unleashing a brutal terror campaign against its people. Pakistani progressives, Jam in particular, were mindful of the such excesses and undemocratic actions of the ruling PPP yet were unwilling to become unwitting promoters of direct military rule. In July 1977, after less than 6 years out of direct control of Pakistan, its military took over. An “simpleton, god-fearing” General ZiaulHaque took over the reins of power in Islamabad. And with that Pakistan descended into the long dark night to tyranny. Bhutto was silenced under a trumped-up murder charge, subsequent conviction, and was eventually executed. The Islamic Revolution in Iran brought the tyrannical regime of Shah of Iran to an end. PDP, an alliance of Marxist parties, won in free elections in Afghanistan. The US turned on their policies of destabilizing Soviet Union by way of making an incursion inside Afghanistan. Zia, who promised a “90 days” transfer of power back to an elected entity, emerged as the most brutal tyrant. His reign saw the wholesale Islamisation of all aspects of society, economy, and polity of Pakistan. Jam was instrumental in leading a solid faction struggling for the restoration of democracy in Pakistan. Alongwith many other leaders he too was jailed, tried and eventually released. With the fall of the Soviet Union in 1991, a general despair and gloom clouded the otherwise somewhat vibrant socialist struggle of the people of Pakistan. A large number of “progressives” eventually morphed into “liberals” and engaged gainfully with the burgeoning and lucrative West-supported “NGO” sector which was fast becoming a big feature of the Pakistani civil society. Unlike many old stalwarts, Jam successfully contained the temptations for finally obtaining wealth and power. He remained steadfast. However, for a few months he did, however, work with then prime minister Benazir Bhutto’s PPP as a labour advisor to the Chief Minister of Sindh. He remained a rather dormant member of the PPP until his death. He is survived by his spouse and six children. He leaves behind a legacy of seven books, of hope, of faith in people and in the struggle for socialism. He taught us how not to ever give up, how to forever remain optimistic. A moving and insightful tribute to Jam Saqi. Hope to see more contributions from Zahid Makhdoom. Grateful to you brother Ali Mohsin for your generous comments. Stay well.